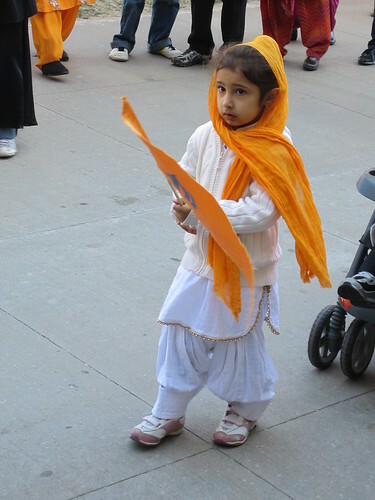 A Sikh girl in Detroit, Michigan celebrates Vaisakhi (also known as Baisakhi) at Wayne State University. More photos of that celebration is available at the Wayne State University flickr feed. It was during this time in 1699 that Guru Gobind Singh dramatically created the Khalsa order in which Sikhs took on the formal characteristics that we know today. Across the United States, Sikhs will celebrate Vaisakhi by holding a Nagar Kirtan, a religious procession through their community.